I've seen sporadic questions about citrix around here, and either everyone has figured it out or moved on to another distro. (Yes, some of us are forced to use citrix for our jobs). 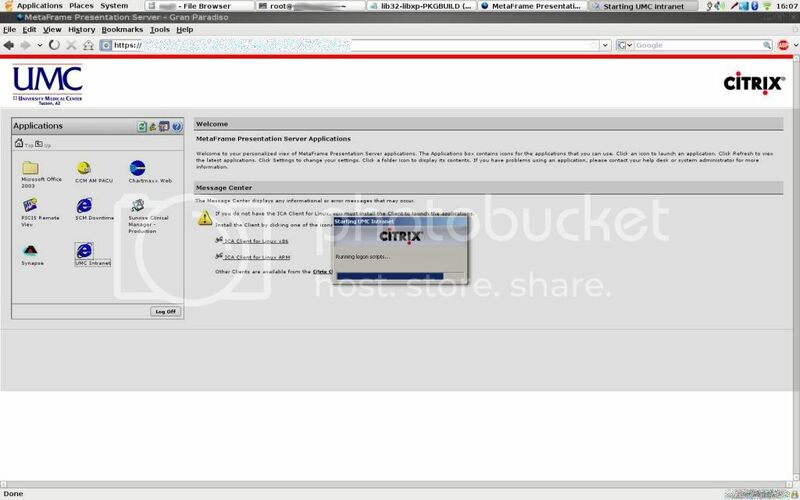 Here is how I got the citrix ICA web browser plugin to work with Arch 64 and firefox. Disclaimer: I'm not a programmer. There are probably better ways of doing this (... I should NOT be running yaourt as root, for instance), but I'm busy and only have so much time to troubleshoot. Unfortunately the lib32-libxaw and lib32-libxp PKGBUILDs contain outdated links. We will fix this as we go. The yaourt script downloads the PKGBUILD, then asks if you want to edit it before it builds the package. For lib32-libxp and lib32-libxaw we will paste in a new PKGBUILD, lib32-libxpm works as is. pkgdesc="Allegro is a multi-platform game library"
it will then install and download the PKGBUILD for lib32-libxpm. This one points to the correct file and does not need to be edited, so you can allow yaourt to continue and finish installing. For those who wish to use the new 64 bit flash plugin (alpha but works fairly well), the package nspluginwrapper "conflicts" with flashplugin-alpha-64, but flashplugin-alpha-64 does not conflict with nspluginwrapper. nspluginwrapper really does conflict with the 32 bit flashplugin, but not the new 64 bit one. FYI, on my installation, I did not need to install lib32-xaw, lib32-libxp, or lib32-libxpm. I also used the standard nspluginwrapper (not beta). It installed fine alongside my flashplugin-x86_64, which is the new 64-bit flash without having to worry about dependencies. Might be worth a wiki article. Firecat53, i'm glad yours is up an running. Has anyone tried to setup a package build for the Citrix Client, preferably native 64-bit? I appreciate the instructions. I downloaded this from AUR after installing openmotif. I was expecting to do like I did with OpenSUSE and that is to download the certificate and move it to the right folder. I of course can not do this because of security. I am sure I might be able to do this with the move command but that is a pain to do. I would love to do this using Dolphin but because only one version comes with Arch this is not possible to do. I guess I will try the nspluginwrapper and see if this helps. Brilliant guys, thanks very much. Works a treat! Guys, I cannot seem to locate "lib32-libxaw 1.0.5-1" anymore, I am supposing that it has been renamed or moved. Does anyone know where I can point the PKGBUILD so that I can get this working? Much appreciated! I would love to see this updated as well. Their is a wiki for this but it does not seem to work for me. I do not know if it is because I have used firebrand on my browser or what. I came from OpenSUSE and this had a simple install of Citrix and it was easy to connect. To bad this does not seem to work. All - I very much appreciate all of the posts above. I followed the instructions here and have Citrix working on my Arch Linux 64 bit system with FireFox better than I have ever seen it work in Linux. So cool. I have had the same problem, and I succeeded by installing the lib32-libxaw from jeremy's script and lib32-libxp lib32-libxpm from the AUR. Can someone verify that the current lib32-libxaw from the AUR works? Because of the recurrent nature of this problem, I haved added the instructions above to the wiki page about Citrix. I wanted to thank you for updating the wiki. It helped me out and I was using the 32 bit version of arch just to get this to work. I wiped my system clean last night and reinstalled it so I could see if this worked and it did. I do not follow the wiki for the part about installing the citrix-client as I get this from aur. I am happy that I can use the 64 bit version now and I appreciate the work that you did to make sure this worked. lib32-libxaw is properly updated in the AUR. No need for the alterations to pkgbuild. I've never used nspluginwrapper so I I think I must have done something wrong here. I looking for help getting the "normal" client of citrix running on x86_64. I'm the maintainer of citrix-PKGBUILD in AUR at the moment. Because our citrix-server don't support http-connection I can't use the firefox plugin and therefore I'm trying to get the client working but I don't have an idea anymore. I'll commit the PKGBUILD for lib32-openmotif later to AUR. The problem which occures is that the client tries to convert the characters. Ok, by the time I wrote that it wasn't. It may be nice for users that do require http connection that you insert the nspluginwrapper line. If that doesn't work, maybe installing it system wide in usr/lib/ICAClient/ works better. I've added the line to .install script as information together with the wiki-page. I followed your wiki, you need to install lib32-openmotif to get it working and you should never link libraries. You should add all lib32 packages to the lib32 group. So you can unistall all in one command. I also have to problem that it can't convert UTF8 to Unicode, maybe something to do with the locales on the system? Do you have correctly displayed characters? I only get '?' instead of each character.